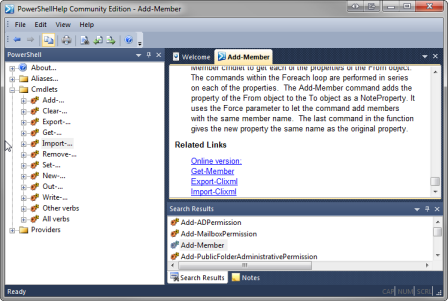 Last week when I blogged about iPowerShell from Sapien, I mentioned they had a few free community tools. One of those is PowerShell Help Community Edition. As you can see, it provides a simple, easy to you way to navigate help in PowerShell. I find this especially nice as I often have my editor open in one window and want help files or other reference materials open in a second. Down the left is a tree which allows you to navigate to the type of object you are seeking help for. It also supports search, you can see the search results pane in the lower right. Like iPowerShell, it uses the standard PowerShell help format, so you can add in any PowerShell help file, just as you can with iPowerShell. Best part is the price, it’s free! Just go to Sapien’s website, to the download center, and navigate to the Community Tools section. Select your flavor (32 or 64 bit). One little quirk I was having that someone in the support forums helped me with, and this was a Windows issue not a PowerShell Help issue. I wanted to create a docked shortcut for this right in the Windows 7 task bar, but it wasn’t letting me. Turns out if you have the word Help in your file name Windows “protects” you by not letting you add it to the task bar. I created a shortcut, renamed the shortcut to remove the e in Help from the file name, and all was well with the universe.